In the last 20 years or so, reported incidences of irritable bowel disease (IBD) have gone up about 33%, according to the Center for Disease Control. Currently, more than three million adults report having either Crohn’s disease or ulcerative colitis and more are diagnosed every day. At the same time, the costs associated with IBD create additional strain on many patients, often influencing their chosen courses of treatment. There is currently no cure for IBD, and while treatment options continually improve, many patients face a lifetime of daunting hospital bills, insufficient insurance coverage and expensive medications. I discovered all this through personal experience, beginning about 10 years ago when I was first diagnosed with Crohn’s. I was young, presumably invincible and never worried about health insurance. But what I quickly received was a crash course in IBD, healthcare coverage (or a lack thereof), the incongruity of healthcare costs and much more. I’ll never forget the day I was diagnosed. I awoke groggy and confused, still in the midst of a propofol-induced haze that followed my first colonoscopy. I was 25 at the time, just about half the age when the average adult experiences this awkward and invasive rite-of-passage. I’d finally acquiesced to the procedure after about a year of myriad testing to determine the pathology of my on-again, off-again inflammatory gastrointestinal symptoms, the details of which I won’t bore you with now. I’d alternately been told it was likely celiac disease, a parasite, small intestinal bacterial overgrowth (SIBO) and Clostridioides difficile (C. diff). After testing negative for all of those, here I was, trying to get a final diagnosis, once and for all. I was devastated. What on earth was colitis and what was Crohn’s? Why did this weirdly enthusiastic doctor think I should be so excited? I had no idea what any of it meant, but I knew that my life had just permanently changed. Over the next year, my health continued to deteriorate significantly. I ended up in a hospital on the other side of the country, emaciated, in extreme pain, and being fed through an intravenous tube. I hadn’t eaten more than a couple of morsels of food in weeks and couldn’t walk on my own. I was barely able to focus as a different doctor informed me that I’d been misdiagnosed—I actually had Crohn’s disease. I couldn’t help think about the first doctor and how darn disappointed she’d be. But what I didn’t know in that moment, was that this was just the beginning of a journey that would lead me on an educational, painful, deep dive into the absurd monstrosity that is the American health care system. At times I’d receive bills in the tens of thousands of dollars, find myself yelling at doctors and occasionally wheeling and dealing to negotiate down a hospital bill like I was buying a stolen stereo out of the trunk of someone’s car. When I was first diagnosed, I had a “catastrophic” insurance plan. This is what broke 20-somethings used to buy in the days before the Affordable Care Act (ACA). These plans were only for people who thought they were invincible and included a bare minimum of coverage, essentially insuring against freak accidents. My annual out-of-pocket maximum (OOP max) was something like $25,000-$30,000. In summary, this was a terrible plan for someone just diagnosed with Crohn’s. The hospital bill from my first stay totaled more than $64,000, of which I was expected to pay the aforementioned OOP max. To put this in perspective, at the time I worked for an international athletic training company and made $30,000/year before taxes. Additionally, approximately $8,000 of that bill was for a medication I’d now receive as an infusion every six weeks, Remicade (infliximab), in order to control my extremely high inflammation levels. With my catastrophic insurance plan, I’d be responsible for a portion of those bills larger than my annual income. So, being an industrious sort, I was highly motivated to avoid this impending, eternal and soul-crushing debt. I began shopping around for a new insurance plan…with a pre-existing condition…before ACA protections existed. It would be an understatement to say that I was a less-than-desirable prospect for insurers. You can probably imagine how it went. I was turned away by every single insurance company, with the exception of one that offered me a plan for $1,500/month with no real benefit or expense improvements beyond those of my catastrophic plan. They did not act surprised when I passed on that. Build up debt until it gets so high that it’s worth declaring bankruptcy. Marry someone with good insurance—I’m kind of joking, but really did have this conversation with my partner at the time. We ended up married anyway, but it was quite a few years later for far more romantic reasons. Move to another country with universal health care—This could be an entire blog post on its own and has seriously been on my radar at times. Get a new job with group health benefits—This seemed like the simplest solution and didn’t require any lifetime vows or moving costs, so I thought I’d give it a shot. Even before ACA, insurers couldn’t ask about pre-existing conditions of employees being added to company group insurance plans. Nowadays, ACA provides protections for individuals with pre-existing conditions so insurers can’t ask under any circumstances, but that’s a relatively recent development. Not having those protections at the time, I accepted a job offer at a new company and gladly signed on to their group insurance plan, feeling like I’d just gotten away with murder. My new insurance had a $10,000 annual OOP max. That may still seem high, but remember, this was about a third of what I’d previously been paying, which made it more doable, as long as I never wanted to do anything crazy like, say…retire or take vacations. I still wasn’t quite satisfied with that annual price tag, so I also pursued supplemental reimbursement options, which some pharmaceutical companies offer for patients on specific medications. Remicade is made by Janssen, a company that offers the Remistart program, which reimburses enrolled patients for a portion of the costs of the medication. The Remistart website states that, “eligible patients pay just $5 per infusion.” Well apparently I wasn’t fully “eligible,” for the full reimbursement, but I did receive some funds out of this program, which made it worth the hassle. However, it was certainly not easy. At the time the reimbursement process was completely manual, requiring that the forms be submitted in hard copy via mail along with a hospital Explanation of Benefits (EOB), a document which details the services and medications received by the patient. In subsequent months, I did occasionally receive reimbursements for seemingly random sums of money and never understood the basis for these specific amounts. There were also often discrepancies in the EOBs that disqualified me for reimbursement. The hospital would sometimes list my Remicade treatment as “chemotherapy.” Remicade is in no way similar to chemo, other than the fact that it’s administered through an infusion. In these instances, Remistart would refuse my reimbursements as they did not explicitly delineate “Remicade” as a line item on the bill. I approached the hospital several times to get a corrected document, all to no avail. This misrepresentation on the EOB cost me significant reimbursement funds over time. Still, for anyone who is paying anything out of pocket for Remicade, I’d recommend utilizing the Remistart program. It may work out for you and the process may have improved since I initially applied for it about a decade ago. You can read more about it at this link. About five years ago, I made another career shift and began working at a public institution that has a “Cadillac” insurance plan. Currently I pay $0 in monthly dues for my insurance, as the entire cost is picked up by my employer. I nearly sobbed with joy the day I signed the paperwork. 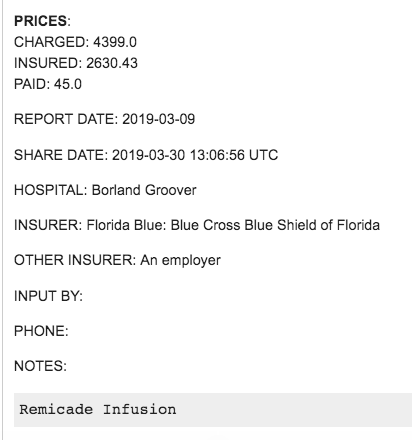 This insurance plan is also one of the few I’ve ever encountered that covers 100% of the Remicade costs within its prescription plan, which means that no expense is passed on to me. So I’m set for life, right? Not quite. Issue 1: This is the ultimate set of “golden handcuffs.” I like my job, but the idea that I absolutely can’t ever leave without threat of incurring massive medical debt is quite daunting. Issue 2: There is no guarantee that my insurer will continue to cover Remicade. This has actually become an issue recently and I’m honestly not sure how it’s going to be resolved. To give a little background on why this is such a concern, let me explain a little bit how Crohn’s disease and Remicade work. Please keep in mind I’m not a doctor and am making some generalizations to simplify this explanation. Crohn’s is a chronic inflammatory disease in which the body’s immune system attacks the gastrointestinal system, resulting in inflammation. The primary culprit of this misdirected aggression is TNF-alpha, a protein that can cause excessive inflammation in patients with diseases like Crohn’s, ulcerative colitis and rheumatoid arthritis. Remicade is a “biologic” medication that works by binding to TNF-alpha, thereby making it ineffective and reducing a patient’s inflammation levels. However, because of its biologic nature, it is possible for the patient to build up antibodies to it. If that happens, the patient becomes “immune” to Remicade and will no longer see benefits from this medication. Research has shown that the odds of building such antibodies increase if a patient stops taking the medication for an inordinate period of time. This occasionally happens when a patient can’t afford the drug or wants to try other treatment options. I’m one of those crazy people who just can’t completely accept the idea that I’ll be on this drug for the rest of my life. Every few years, I revisit the idea of eventually weaning myself off Remicade. Every time, my doctors warn that if I go off of it, I may become immune to it and be unable to resume treatment if needed. There are other versions of biologic drugs, but there’s always a risk that other biologics won’t work for any individual patient. So, the moral of the story is that going off the drug could mean that you get sick and stay sick forever. If that sounds terrifying to you, it’s because it is. I have successfully been persuaded away from this course of action by every single doctor I’ve broached the idea with. I believe they’re giving me this advice in good faith, but it’s still disappointing to say the least. But I’m okay, since my insurance covers Remicade, right? Maybe … for now. I received a call from my pharmacy recently requesting that I switch to a different biologic, called Inflectra. It’s a “biosimilar” to Remicade, but is not identical. All in all, the development of biosimilars is a great advancement for patients who receive these types of medications because they are slightly less expensive and may eventually bring down biologic medication costs on the whole. I applaud the effort and advances in medical science. After a decade of being told that switching medications could send me back down the path of uncontrolled inflammation, long hospital stays, excessive weight loss and the pain that comes along with all of that … I’m not real keen to switch in order to save my insurance company money. So, I told my doctor that I’m not switching and she agreed to keep me on Remicade for the time being, with the warning that my insurance may stop covering this medication entirely, forcing me to choose between paying for it in full once again, or switching to the biosimilar…which works for most patients. Most. I wish I could tell you that I have some incredibly innovative or creative solution to this, but honestly, I don’t. I’ll probably switch to Inflectra and it’ll probably be fine. Probably. For the moment, I count myself very fortunate to have the incredible coverage I do, at a time when it seems like health insurance in America is only becoming increasingly daunting and complicated. But in an effort to stay ahead of the curve, I always maintain a multi-pronged plan for coverage options in preparation for whatever the future many bring, including future job changes and *cringe* the possible dismantling of ACA. So in that spirit, I leave you with the following list of tips and advice that I’ve learned from years of wading through the muddy waters of US health insurance. Be your own advocate- Learn about your diagnosis and medications and ask your doctor questions. Here’s one resource: The Crohn’s & Colitis Foundation. And if you don’t like your doctor, don’t be afraid to switch. Ask for quotes for medical services and medications. These are not easy to get, but in my experience, if you try hard enough, you can occasionally get an answer. Negotiate- When you have a large hospital bill, try to call and see if you can negotiate it down. I’ve found this works on occasion and when it doesn’t, you can often set up a no-interest payment plan. Learn the basic structure of health insurance plans, so you know what you’re entitled to, can compare plans and know when you’re being incorrectly charged. Watch the news. Healthcare is a topic of much political debate at the moment and being informed will keep you in the know about possible changes to ACA or other laws. Participate in things like clearhealthcosts.com. The more people who submit their costs to this site, the more tools other patients have available when making decisions about treatment. Get creative. When the going gets tough, the tough look for loopholes. You read earlier about all the options I considered after I was first diagnosed, including anything from bankruptcy to moving out of the country. Put everything on the table and weigh the pros and cons. You can see a great example of a creative solution at this link, where one Remicade patient discovered she could save a significant amount of money by using an in-home infusion service.